Motocross champion Cody Elkins, who holds the world record for the longest moving jump on a quad bike (73 feet, 4.5 inches) has been added to the lineup of athletes competing at the inaugural St. Pete Action Sports, Dec. 4 and 5 at Al Lang Stadium. The exciting, all-star event combines FMX, BMX Big Air Triples and skateboard verts.Motocross champion Cody Elkins, who holds the world record for the longest moving jump on a quad bike (73 feet, 4.5 inches) has been added to the lineup of athletes competing at the inaugural St. Pete Action Sports, Dec. 4 and 5 at Al Lang Stadium. The exciting, all-star event combines FMX, BMX Big Air Triples and skateboard verts. But don’t take his word for it. See for yourself Friday and Saturday when Elkins goes head to head with the top freestyle motocross riders in the world. 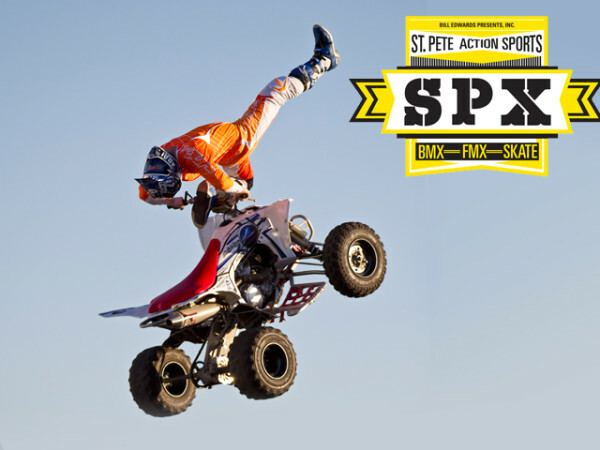 Elkins, who holds the world record for the longest moving jump on a quad bike (73 feet, 4.5 inches), will be one of more than a dozen daredevils in the lineup at the inaugural St. Pete Action Sports. Widely considered to be the world’s top quad rider, Elkins will perform flips and tricks on the same ramps as the Freestyle Motocross pros. “I am a little bigger, 6-foot-1 and 200 pounds, than the average rider,” he said. “It is a physical sport. … I’ve broken more than 80 bones over the years. But when you do what I do, it comes with the territory. Along with Elkins, the field of FMX riders includes other well-know riders Adam Jones, Mike Mason and Javier Villwegas, seasoned veterans accustomed to keeping spectators on the edge of their seats. The BMX pros include Ryan Nyquist, who has won 16 medals at the X Games, Colton Satterfield, who recently made history by becoming the first BMX’er to hit a double flair on the Big Air, and James Foster of Nitro Circus fame. Tickets are available at stpeteactionsports.com. Single day tickets: General admission $30. Two-day tickets: general admission $50; child (ages 3-12) $40. General admission student tickets (with valid student ID) are $20.